The golden rule we should all keep in mind this New Year is that if you bake your doughnuts, you can top them with anything you’d like; they’ll still be healthy because they’re baked. So go ahead and get crazy. Add that chocolate, place those marshmallows on top, and make it rain down graham crackers because all bets are off. 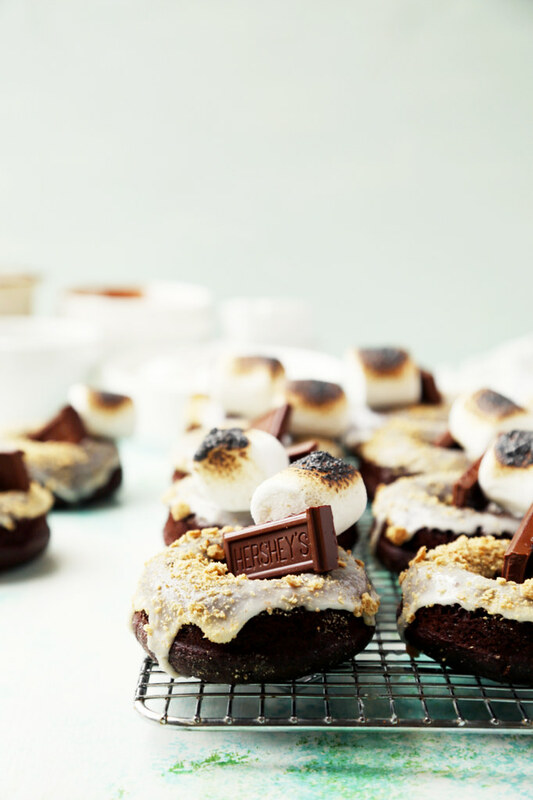 The more you fight it, the more these s’mores doughnuts will call to you. They’ll wake you up in the middle of the night. Do you really want that? Sure, we’re all trying hard to make healthier choices, and yeah, there’s been talks about clean eating and diets and cleanses, but deciding to bake these doughnuts instead of frying is about the healthiest decision I’ll ever make. I’d say that I’m nailing this whole New Year’s resolution thing. I’m basically a pro. I didn’t eat s’mores as a kid mainly because I had no idea what they were. (Go ahead and feel sorry for me now, I deserve it). I also didn’t eat them because whenever there were marshmallows in the house, you could bet that mom would be making rice cereal treats for my sisters and I. I never complained, though, because I actually happen to really love rice cereal treats, especially the way she makes them. I don’t know how she does it, but mine never seem to come out as good. And it’s not like they’re complicated or anything. She just has the magic touch, I guess. Now as an adult I know all too well what I’ve been missing out on. S’mores are out of this world. I’m making up for lost time now, by baking them up completely from scratch and sandwiching them together with these Homemade S’mores, and turning them into tiny cakes with these S’mores Cupcakes (from the vault). 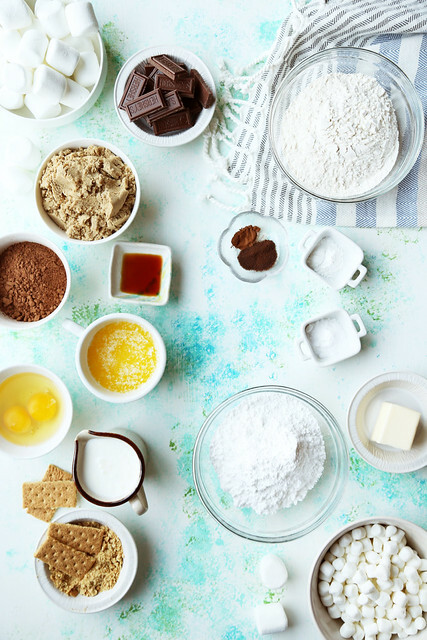 Whatever your vice is, you now have a slew of delicious s’mores desserts to choose from, here to remind you of your childhood. There’s something for everyone. I think by now you’re already well aware about my love—some might call it an obsession and maybe they’re right—with doughnuts. In case you didn’t already know, maybe these Baked Blueberry Crumb Doughnuts will convince you. 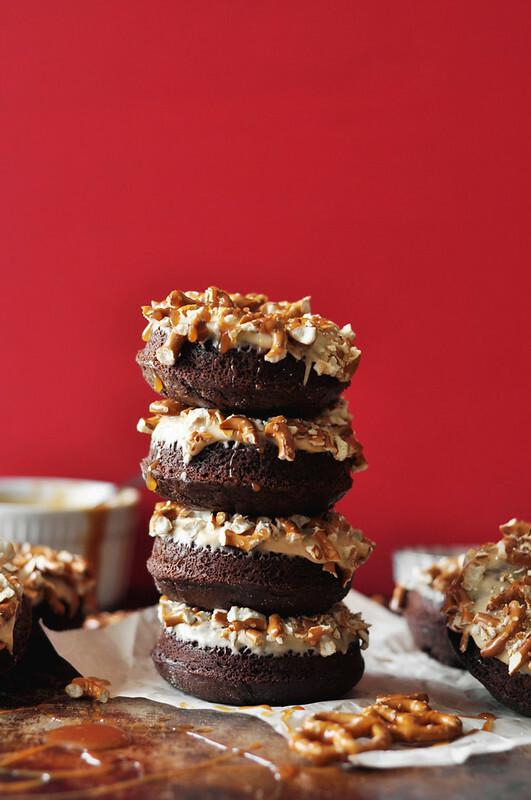 Or these Baked Peanut Butter Chocolate Doughnuts topped with chopped peanuts and lots of chocolate. Finally, perhaps these Bourbon Blueberry Basil Doughnuts will do the trick. They’re perfectly boozy and sweet. It’s safe to say I’m addicted, but nothing to worry about because I have a number to a group on hand, just in case it ever gets to that point. Not that it ever would because I don’t see a problem with eating doughnuts by the dozen until you can’t eat anymore. That’s totally normal, right? Yeah, it’s normal. Doughnuts are meant to be eaten two at a time and frequently, at that. You can quote me on that. My love for doughnuts is so big that I actually created a special day for them. National Doughnut Day, which is on June 6th by the way (just around the corner), is a holiday that I created to celebrate the best dessert/treat/breakfast item ever invented. You’re welcome. Okay, so maybe I personally didn’t create the day itself (I totally should have though). I actually don’t know who did, but whoever declared June 6th National Doughnut Day, is a hero in my eyes. I’ll never forget you. Thank you random person I don’t know for making this special day possible. A monument should be built in your honor. National Doughnut Day? More like National Jonathan’s Favorite Holiday Let’s Celebrate by Eating Tons of Doughnuts Day. Or something like that. I’m still working on the name. So in honor of this special day, I decided to make doughnuts for the blog. Also, I began realizing that I hadn’t posted a doughnut recipe in a while. We can’t have that. That’s a really big problem. So I thought since I don’t have any chocolate doughnuts on here yet, I just needed to make a chocolate doughnut recipe. 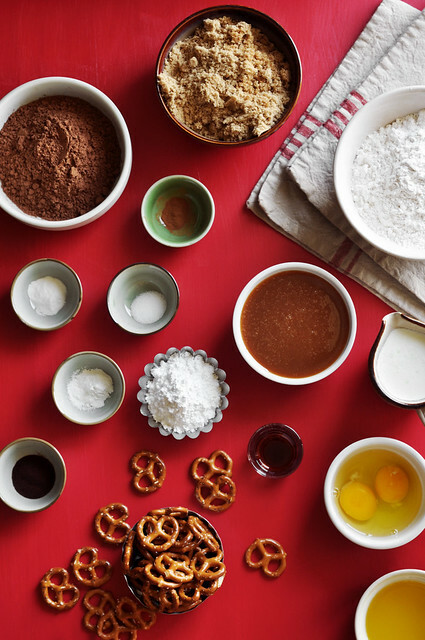 And what goes better with chocolate than salted caramel? Well, maybe crushed up salty pretzels because it’s the way it always should be. I baked these because I was too lazy to go through the entire process of making the dough, letting it rest, rolling out the dough and cutting them and then frying them. My head was hurting just thinking about it. I also didn’t fry them because I figured if I slapped on the work “Baked” right to the front of this recipe, it would instantly become healthy. So here I am with my healthy doughnuts, taunting you to make them and eat them. You can thank me later, right now, just go out and celebrate National Doughnut Day.